Home/Geology, Main Page/A Sixth Mass Extinction Event? A Sixth Mass Extinction Event? A team of geologists have published a paper in the prestigious Geological Society of America Bulletin postulating that there was a major global extinction event that took place in the Permian geological period. To be more precise the evidence for the extinction can be found in rocks laid down approximately 262 million years ago (the Capitanian stage of the Guadalupian epoch of the Permian). The idea that there was a major extinction event amongst both marine and terrestrial organisms in the Middle Permian is not new. Studies of the diversification of marine invertebrates recorded in Mid Permian strata from lower latitudes indicated that several families of mollusc and Brachiopod had died out during this time in Earth’s history. It had been thought that global cooling had resulted in the loss of so many types of marine animal from the tropics. However, this new study indicates that the Middle Permian extinction is manifested in the fossil record preserved at higher latitudes. To assess the extent of the extinction, the research team, led by Dr. David Bond (University of Hull) travelled to the remote Norwegian island of Spitsbergen to explore the Kapp Starostin Formation, a layer of marine strata that is up to four hundred metres thick. These rocks were laid down over a period of around 27 million years and cover the crucial period of the Guadalupian epoch. By assessing the number and type of Brachiopod fossils found in the rock layers, the scientists were able to demonstrate that there were two severe extinctions amongst Brachiopods in northern latitudes in the Middle to Late Permian. These extinction events are separated by a recovery phase, a time when the diversity of Brachiopods increased. Study suggests global mass extinction event in the Permian. Brachiopods, superficially resemble shelled molluscs like clams and mussels, but they have a very different body plan. They are not closely related to the Mollusca and the Brachiopoda is an entirely separate phylum. These little creatures first evolved in the Cambrian and they are still around today. Most can be found in deep water and they are benthic (live on the sea floor), they are not found in freshwater. There are more than a dozen or so species to be found in the waters surrounding the British Isles. Brachiopods are sometimes called “lamp shells” as some of them resemble the shape of oil lamps used by the Romans. Shells are usually made from calcium carbonate, but some form phosphatic shells. The shells which protect the soft tissues consist of two parts (valves), one part is always bigger than the other part. They are often the commonest fossil to be found in Palaeozoic marine limestones that represent shallow water deposits, as a result there are a number of Brachiopod biostratification zones. Brachiopods anchored themselves securely using a pedicle. Strontium isotope analysis coupled with examination of trace metals and magnetic polarity preserved within the strata, correlated the time of the formation of the layers that show a distinct decline in Brachiopod diversity to about 262 million years ago (Capitanian stage). Older rocks show that Brachiopods dominated the fossil record, but there is an 87% fall in fossil Brachiopod diversity in the middle of the Capitanian-aged rocks. Younger rocks do have preserved remains of Brachiopods but they are different from the ones in the Capitanian strata, in addition, the younger rocks show a change in the fauna, there are many more bivalves (molluscs) preserved as fossils. This suggests that there was a catastrophic event that lasted tens of thousands of years which led to a dramatic change in the benthic invertebrate populations, as recorded by the fossil evidence. The research team visited Spitsbergen three times to conduct the research from 2011 to 2013, working in the month of July, taking advantage of the 24 hours of daylight available and the slightly warmer weather. Polar bears were still a danger and the expedition had to be on the look out in case a curious bear came into their camp. The existence of a separate and distinct global extinction event around 262 million years ago, remains controversial. Just a few million years ago, the biggest mass extinction event known occurred, resulting in the loss of something like 96% of all sea-dwelling creatures. The event is known as the end Permian mass extinction. The vast majority of the invertebrates recorded in the rocks after the Capitanian event became extinct. The authors of the paper, published in the Geological Society of America Bulletin, suggest that their research shows that the Capitanian extinction event devastated fauna in both the tropics and in northern latitudes. 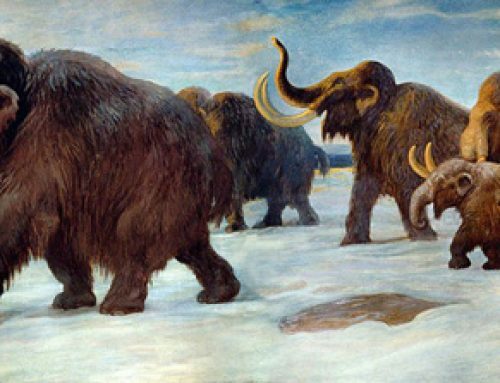 They conclude that this extinction was not limited to the warmer areas of the planet but much more wider ranging, deserving the status of a global mass extinction event. Molluscs and Brachiopods need calcium to make their shells (most of them), Dr. Bond believes massive volcanic eruptions in what is now the Chinese Province of Sichuan released huge amounts of carbon dioxide which in turn, acidified the oceans locking up the calcium. In addition, depletion of oxygen on the sea floor may also have contributed to the extinction event. Today, April 22nd is designated “Earth Day”, a day in which we recognise the plight of our planet, issues like global warming, extinction and loss of habitat. It is apt for us to be considering the evidence for a sixth mass extinction event recorded in the Phanerozoic Eon (visible life).